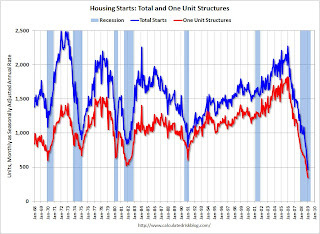 According to Calculated Risk, total housing starts were 464 thousand annualized for the month of January. Now, I remember reading a government report stating that new household units of people were forming in the U.S. at a rate of 1.5 million a year. If so, any bubble in excess capacity over the last several years is quickly reversing itself (see chart). Assuming, of course, that people can still get jobs to afford shelter.